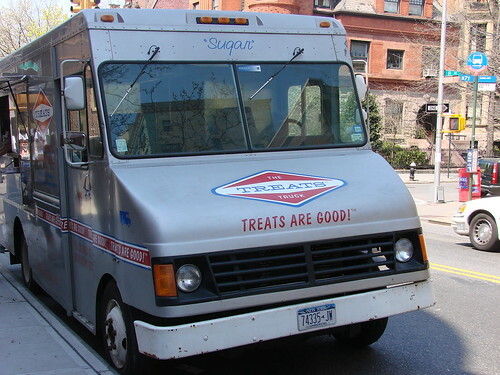 Blondie and Brownie: Taking on the Treats Truck One Treat at a Time: Passover Treats! Taking on the Treats Truck One Treat at a Time: Passover Treats! Now as Blondie mentioned these treats came at then end of a long birthday of eating (I'll bring you more of that this weekend...), so I wasn't starving but Blondie and my mom wanted to break into the treats while we enjoyed our birthday drinks at the Rainbow Room. 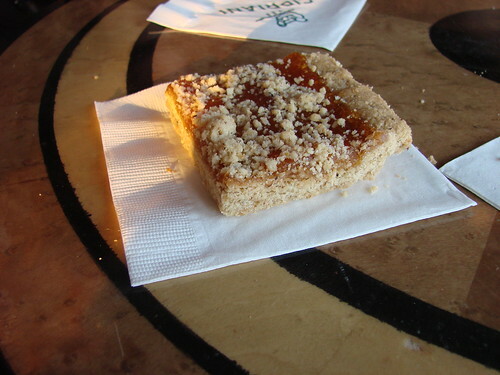 So, we forged ahead and started with the apricot square. 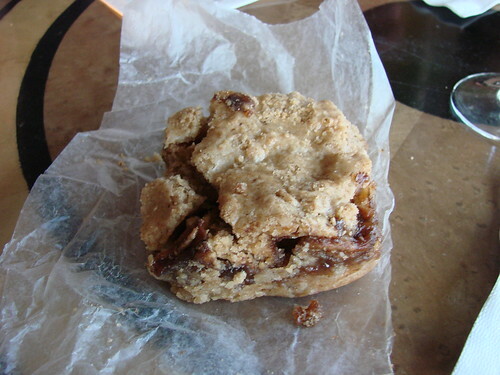 It was sweet and pleasant, but very crumbly. We were constantly sweeping the table to avoid discovery. I wished that the ratio of crust to topping were a little more favorable to the topping. Next up, the apple cake which was appley, rustic, and sweet but not overly so. Blondie thought it should be called an apple pie square instead of cake, because even though we knew the treats were unleaven and flourless for Passover, calling it cake evoked a certain expectation of spongyness, (though as a couple of Gentiles, we've never had one of those Manishevitz Passover cakes from a box, so we can't compare--this apple cake may very well be the height of Kosher for Passover cake deliciousness). Various Locations around the city. Root Beer Floatie Cupcakes Revisited! Chow Chow Cupcakes on Martha! Brownie Chows Down in Utah!